On July 24, 2008, a Norman family dream came true as the inaugural fundraising effort of The Snow Shoe Club reached its peak. That day, Chuck climbed to the summit of Mt. Rainier in Seattle, Washington, bringing the hopes and hearts of many along with him. Inspired by our vivacious friend Carol Hawk, we chose to raise awareness and financial support for Multiple Sclerosis (MS). A priceless collection of wonderful supporters gave generously as we brought good people together to support a good cause. Together, we made a significant impact with our donations of more than $8,000 to the National Multiple Sclerosis Society. We’re hoping you will help us make another powerful difference, because in 2010 we’re climbing again! 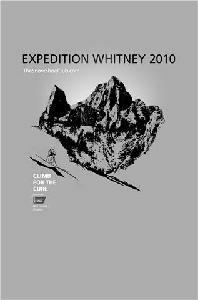 Expedition Whitney 2010 will find Chuck pursuing the summit of the tallest peak in the continental United States on April 1 - 4. The mountain rises to 14,495 feet and its elevation inspired us to set our fundraising goal at $14,500...one dollar per foot to support the pursuit of a cure for cancer. Our selection of a beneficiary cause this year was heartbreakingly clear. In February 2009, Elena’s beloved father Ernesto Valadez lost a valiant battle with the blood-borne cancer, Multiple Myeloma. Just a few months later, cancer also claimed a friend and firefighter Mike Ganley. In July, an unexpected cancer diagnosis rocked the family of Steve McElroy, the Best Man in our wedding nearly 10 years ago and the Best Friend to Chuck for more than 20 years. Then in August breast cancer claimed the life of Sheena Hutchinson. Sheena, a vibrant 45 year old mother of Abby and Alec and devoted wife to Jeremy, had been a dear friend of Elena's since they were roommates in Cleveland in the early 1990's. Sheena delivered a reading during our wedding...and was a precious friend lost far too soon. Likewise, we remember Craig Turgeon, who passed away at 24 after a 20+ year battle with cancer. Craig's friendship and that of his family changed our lives for the better. So, This year's climb is dedicated to the cherished memory of Ernie, Mike, Sheena and Craig ... as well as Regina, John, Scott, Robert, and so many others. It's a testament to those bravely combating cancer - Steve, Virgil, Tom, Betsy, Maria, Bruce, and so many others. The tapestry of cancer is woven through all of our lives and we are humbled by the realization that no family is left untouched by the tangible loss and pain caused by this disease. It is essential that we work together to support the quest for a cure and in turn, the climb for a cure. On our collective behalf, Chuck will climb in honor of those we have lost and those who fight bravely. This climb will once again be a symbol of hope for the cure and a source of help for the cause. There are a several ways to stay connected to The Snow Shoe Club! As the web site further explains, donations to the American Cancer Society may be directly online via a secure website (and the links established will ensure that your donation is associated with the Snow Shoe Club). 100% of the money raised for Expedition Whitney 2010 will go directly to the American Cancer Society, (and all donors will receive appropriate tax documentation directly from the organization). The Snow Shoe Club serves as the framework created to bring our abundant collection of friends and family members together to support causes of tremendous personal importance. If you would like to purchase an Expedition Whitney 2010 t-shirt, please reply to this email...and for a $20 donation you can help support the cause! Thank you for taking the time to consider this invitation to get involved. We welcome any amount of support you would like to contribute. We are truly blessed to have such an abundant collection of precious people in our lives! We are so thankful for each of you and we are also deeply grateful to be in good health. The Snow Shoe Club benefits those in need who may not have such an expansive network or such excellent health … and we encourage you to join us once again in offering them some much-needed support. Individually, we can each make a difference … but together we can make an impact! On behalf of Chuck, Elena, Victor, and the other members of The Snow Shoe Club, we hope we can count on you once again in 2010. We look forward to keeping everyone connected as the countdown to the expedition continues! Loving the information on this blog, you have done outstanding job on the blog posts. Unbelievably individual pleasant site. Astounding details readily available on few clicks on. I enjoy the knowledge on your web sites. Appreciate it! Gracias por presentar esto excelente referencias. Muy agradecido! Sin la menor duda distribuire esta pagina web junto a mis amiguetes. Thanks regarding giving these substantial write-up. Thanks with regard to delivering these good write-up.